Many people end up confusing between color correction and color grading. It’s like one is the form, the other one is an art. Color correction might first be used to balance out the light of the shot, the grading is completely different in manner, so it is not difficult to make cinematic video with color grading tutorial. In this article, we will let you know how to do color grading in FilmoraPro. Continue reading this tutorial. Generally, Color Grading is a process of enhancing image that involves in changing the colors of the actual image. This includes, making changes over various parameters of the image like contrast, black level, color, saturation, black level or still images etc. The process of color grading is executed after due color corrections are made. Complement input/output: It’s next to impossible to figure out the resultant shot as it looks entirely different as the timeline plays down. Brushing away distractions: Biding bye to the isolating spots or the irking objects that prevent shots to be matches together. Handling spectator’s view: Making use of shape masks or attracting eyes to suitable point of interest. Managing results: Color grading is drawn to style an image to give flashback, dream sequence or re-creation to altogether give a distinct feel to the image. To make the best of both the worlds, FilmoraPro is certainly a tool you must get your hands on to. Equipped with the latest specs, this video editor does more than mere edits. By using this editor, users can enjoy merging different clips, range markers and perform insert audio and video over the clip effortlessly. Here is the detailed guide on using different effects used in the color grading panel of FilmoraPro. 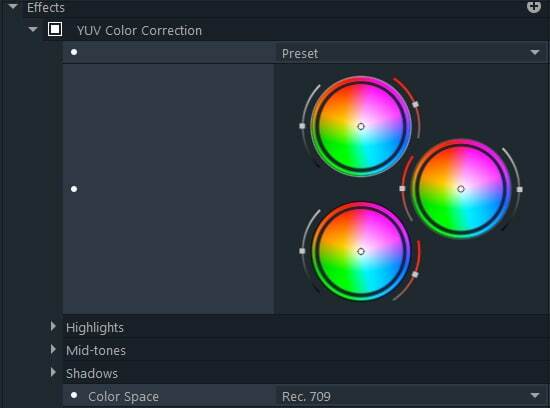 To giving an air of great effects, customizing YUV color correction on your clip is real easy. Just, open the Controls section and opt for the “Effects” option. From the drop down window, select the “YUV color correction”. Here you can do fine tuning, improvisations on the desired image. Optionally, drag “Highlighter slider” and “Shadow slider” to give a touch of the color over the clip. 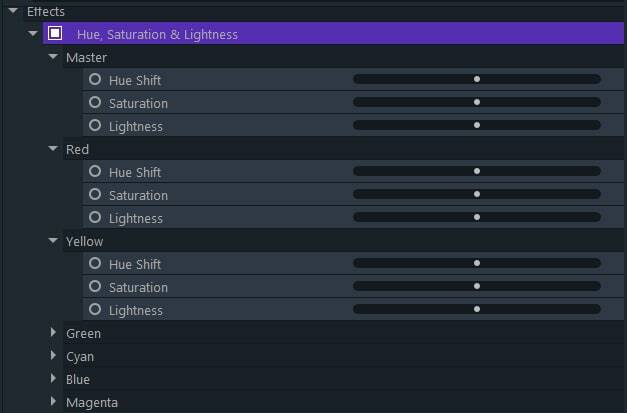 The most common “Hue, Saturation and Lightness” type of effects can be undertaken in Filmora Pro. Just, start with “Effect” > selecting “Color Correction” option. Then, click on the desired color and adjust the “Hue shift” “Saturation” “Lightness” parameters respectively. For changing the lightness of the image, use the “Light & Flares” option of “Effects” followed by “Anamorphic Lens flare”. This gives you various options such as changing alignments, fixing the “Vertical Points” Colorize- setting amounts. To manage the intensity, drag the bars of “Tracks” of play head. To customize portrayal of the video, use vignette effect. Just go to “Effects” > “Vignette” and make due changes on the presets. If you wish maintain same levels of effects in the near future then save the combinations of effects used in the shot as your preset. Simply, select all the effects> right click and opt for “Create Preset” followed by “Save”. These presets will appear on the right hand side panel, which can be used for future course. One of the considerable means of bettering images can be done by DaVinci Resolve. It offers great kinds of effects, template and color grading tools that are capable of making appealing shots. DaVinci Resolve can also manipulate audios and build your project aptly. Has separate sections, handling separate functionalities. No direct channel for uploading the output in social media handles. The process is very lengthy and complex for novice. One of the well coveted options is Premiere Pro- a renowned tool capable of performing edits on the clip. This video editing software can act greatly as a color grading tool and provides a vast range of functions such as “Curves, Vignette, HSL secondary etc. Can open multiple projects or clips simultaneously. Provides graphics and good range of effects. Lose access to app, files and templates created by Premiere Pro after subscription ends. Interface is a bit too tricky. In a nutshell, we’ve touched upon three different color grading tools that eases out the process of color grading. However, the best remains Filmora Pro, for no converter beats its excellent color correcting tool and compelling features of vignette, light and flares etc. Best Volume Normalizers: How to Normalize Audio in Videos?